Upper Deck Entertainment Gives Gamers 10,000 Reasons to Play Marvel Legendary™ at Gen Con Indy! The best four days of gaming are coming up this week at Gen Con in Indianapolis, Indiana and Upper Deck Entertainment is ramping up to make it a memorable week for fans by hosting a variety of awesome activities throughout the show! Upper Deck Entertainment is inviting gamers to “Become Legendary” as we host demos of Legendary™: A Marvel Deck Building Game each day of Gen Con. Fans can also score a FREE Apocalypse (En Sabah Nur) promotional card from the game just for stopping by and finding out a little more about it and the newest expansion set; Legendary™: Dark City. 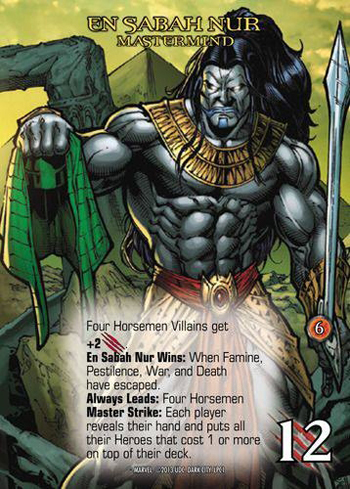 Don’t wait too long to stop by though, these En Sabah Nur cards are only available while supplies last! Own this alternative art card of Apocalypse from ancient Egypt as “En Sabah Nur” from Marvel Legendary: Dark City just for stopping by the Upper Deck Entertainment booth at Gen Con! During the show Upper Deck Entertainment will be running a variety of show specials that gamers will want to take advantage of for purchasing product at Gen Con. A FREE Legendary™: Dark City mega mug can be had with any game purchase. 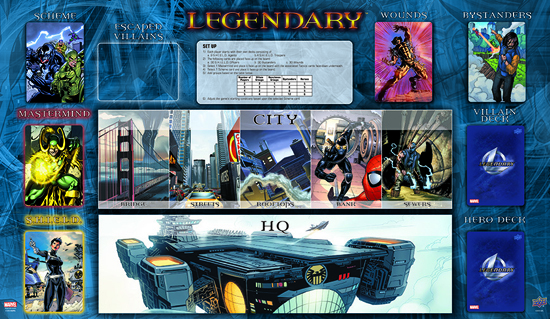 Upper Deck Entertainment also created a Gen Con exclusive Legendary™ play mat for just $14.99. And with any purchase of $15 or more, fans can score a FREE super hero cape available while supplies last! Grab a high-quality Marvel Legendary play mat at the UD booth during Gen Con for just $14.99. The real draw however will be two organized play events around the Legendary™ game. Upper Deck Entertainment is offering up $10,000 in prize money for two tournaments at Gen Con that every gamer looking to stake their claim as the best in the Marvel universe will want to take part in. Both Friday and Saturday beginning at 9:00 a.m. Upper Deck Entertainment will host a $5,000 tournament around Legendary™ (64 person minimum) and with the top 25 players taking home prize money, fans will want to make sure they take part in at least one of these tournaments. 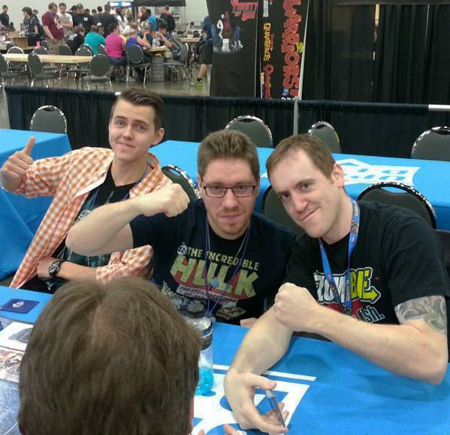 Gamers are encouraged to register through Gen Con now before spots fill up! And check out these tips from a former tournament winner to help you score a seat at the final table! It is a real thrill to be at the final table for a Marvel Legendary tournament, even more so with $10,000 in prize money up for grabs this weekend! After two days of Legendary™ battles, Upper Deck Entertainment will also be hosting a fantastic invitation only after hours event on Saturday from 9:00-11:00 p.m. with refreshments, giveaways and a very special announcement about what fans can expect next from Legendary™. For details on how you can earn a pass to this Legendary™ event, make sure to inquire with Upper Deck Entertainment staff on site. It should be an amazing week, don’t miss it! I would totally LOVE to buy the play mat, i’m willing to pay an exorbitant amount for it! Right now i’m just so disappointed that i live way over in Asia instead of the US. I beg you to make these play mats available for purchase! Please come to the Emerald City Comic Con March 2015. I would love to help demo the game and get my hands on a playmat and promo cards. Will the playmat be reprinted? I’d like to have it.